Astronomers in LAMOST team at the National Astronomical Observatories of Chinese Academy of Sciences (NAOC) led by Dr. Yinbi Li, Prof. Ali Luo and their colleagues discovered 2651 carbon stars from LAMOST DR4 using a machine-learning method, which makes it the largest spectra sample of carbon stars in recent years. In the sample, they also found a group of 17 carbon-enhanced metal-poor main-sequence turn-off stars, which doubled the number of known stars of this kind, among which the one with the lowest abundance of metal is about 1/200 metallicity of the sun. This work has been accepted by the Astrophysical Journal Supplement Series (ApJS, arXiv:1712.09779). Generally, carbon stars are definitely defined as the stars with element ratio C/O >1 in their atmosphere. Carbon stars as cool giants were firstly found in early last century and considered in the evolution stage of asymptotic giant branch (AGB). Astronomers believe that the carbon element in their atmosphere comes from convection process, in which it is dredged to the atmospheric surface of an AGB. Until the first main-sequence carbon star was discovered, researchers realized that accreting carbon from companions in binary systems can be another explanation of carbon stars. A variety of rich samples are critical to the study of its mechanisms. Thanks to the powerful capability of spectral acquisition, LAMOST DR4 released more than 7 million spectra. The research group picked out over 1000 carbon star spectra recorded in literatures as a positive sample to feed into an efficient machine-learning algorithm for detecting carbon star targets in LAMOST DR4. 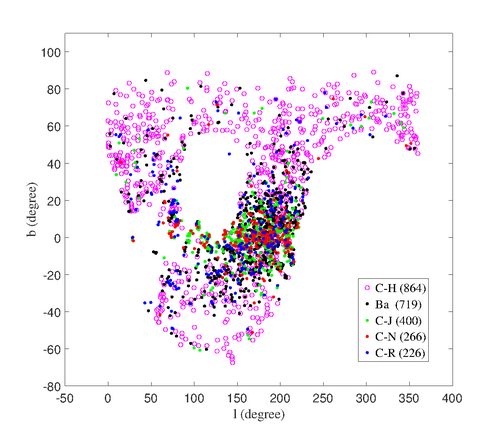 From around 10,000 output of the algorithm, Yinbi Li and her colleague visually identified 2651 carbon stars and quantitatively classified them into five subtypesi.e., C-H, C-R, C-J, C-N, and Ba based on spectral features. Among them, 1415 carbon stars are reported in the first time, and some peculiar carbon stars are also found including 12 stars with composite spectra, 92 emission line stars and 308 G-type stars, which greatly enriched the members of the “carbon star family”. The research group also investigated the properties of the new found carbon stars using the photometry data in the ultraviolet, optical and infrared wavelength band, and found that 25 stars have FUV detections, which suggests that they likely have optical invisible compact white dwarf companions. Figure 1. The space distribution of 2651 carbon stars. Symbols with different colors represent different types. Figure 2. 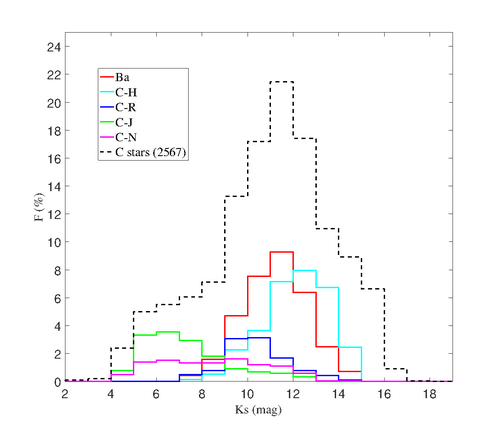 The distribution of Ks magnitudes. Histograms with different colors represent different types.